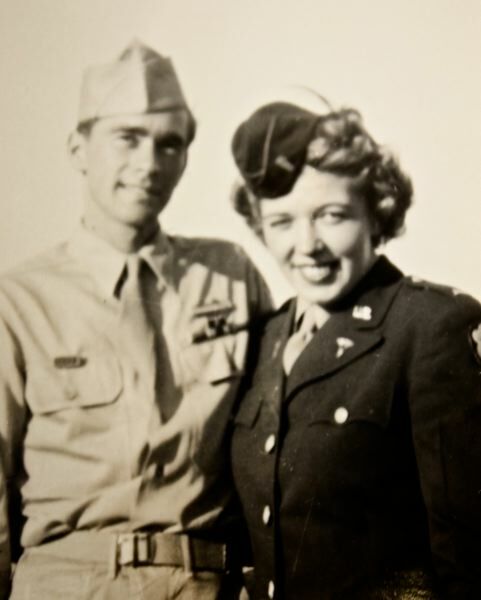 East Multnomah County residents Ray and Betty Whipps survive travails of World War II to be united for life. More than 70 years after leaving the battlefields in Germany, Ray Whipps occasionally still wakes up in a cold sweat from nightmares. Yet each morning as he sips his coffee and looks across the table at Betty, his wife of 73 years, Ray is comforted by her unspoken understanding of the hell he endured and the part she played in his survival. 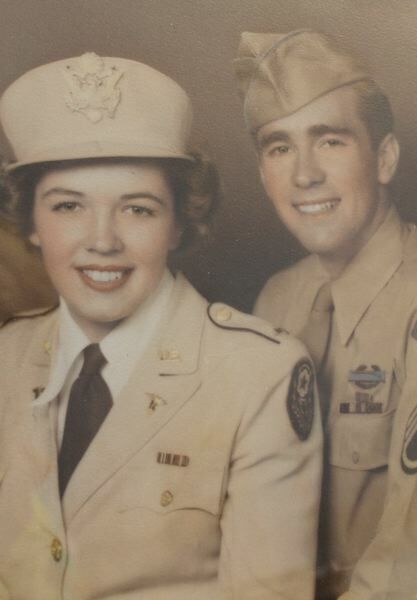 Ray and Betty, both 97, served in the U.S. Army during World War II. He was an infantryman, she was a nurse and first lieutenant. When Ray returned to civilian life, he was a decorated war hero, with three Purple Hearts for injuries received and bravery, along the devotion of a woman who once nursed him back to health. An oral history of their lives was complied by British author Craig Borlase in 2015 for a book titled "'Til We Meet Again." Borlase's hours of documentation, told in first-person by Ray, provide an insight into why the dwindling numbers of World War II veterans are, indeed, "The Greatest Generation." Ray grew up among the farmlands in Columbus, Ohio. He was the fourth of seven children born to a Baptist church elder and former teacher, who shared the family's meager meals with "hobos" in the back yard during the Great Depression. An athletic child with a penchant for climbing trees, Ray developed an obsession with airplanes and becoming a fighter pilot. A few weeks after the bombing of Pearl Harbor in December 1941, Ray enlisted in Navy Air Corps looking to become a fighter pilot. A year later, he joined 50 other cadets in the V-5 aviation program. "We were given officers uniforms right away," Ray recalled in his memoir. "We had a star on the sleeve, instead of stripes, that told other people we weren't officers yet. To my surprise, the infantrymen even saluted us V-5 cadets." Ray spent three months in Ohio learning the fundamentals of aviation before moving on to Gonzaga University in Spokane, Wash., where he finally got into the cockpit of an airplane and made his first solo flight. As training progressed, so did the academic demands of the program, Ray said. The level of math being taught was a struggle for him. But a largely unknown clause in the documents he signed at the Ohio draft board allowed Navy Air Corps cadets to opt out of the program at any time with an honorable discharge. If you flunked out of the program, however, you could be retrained and redeployed as a second-class seaman. "I didn't want to be a sailor, because I get seasick," Ray said. "I wanted to fly because I loved it." Ray chose the discharge. He returned to Ohio, where he revisited the Ohio Draft Board, affixing his signature on an application to join the Army Air Corps. He had missed the monthly entry exam by mere days, but was told he would be called for the next exam. Two weeks later, Ray was called — by the U.S. Army. He was ordered to report to Fort Hayes in Columbus for induction, before heading off to Camp Blanding in Florida for boot camp. Training was tough, Ray said. Along with warfare training like shimmying under barbed wire with bullets flying overhead, Ray said exercises in the Florida sand were worse. "We would dig the foxhole, climb in and then they would run a 30-ton Sherman tank five-feet over our heads," he said. "It was awful." In late May 1944, Ray shipped out of Camp Kilmer in New Jersey for an 11-day journey across the Atlantic to Southampton, England. From there, he boarded a Landing Craft, Infantry, arriving at Utah Beach in Normandy days after the Allied invasion. "There was still a mess on the beach," he said in the book. "I saw German bunkers whose concrete walls had been torn away. I saw stranded American tanks that had been blackened by fire. There were no bodies to be seen but the debris alone spoke of the scale of the battle that had taken place just a week earlier." Ray was attached to the Army's 22nd Infantry, 4th Division. Between June and August of 1944, he went from a greenhorn "dogface" to a respected and seasoned soldier. He served as his company's radio man as they joined Gen. George Patton and the Third Army's push to liberate Paris, was injured in battle and promoted to staff sergeant. He also quickly learned the emotional and physical toll of war. "During my two and a half months in France, I'd been awarded a Purple Heart (for injuries), I'd been shot at by my own fighter planes and I'd watched too many of my own men die," Ray's memoir said. "I'd seen Germans surrender and I'd seen Germans fight to the death. I'd learned to make myself move even when fear threatened to root me to the spot and I'd learned to do as I was ordered — and do it well. Most of all, though, I'd learned that if anything was going to get me through this war, it was my faith in God." After the liberation of Paris, Ray's unit was diverted north toward Belgium. They battled through what was known as the Siegfried Line, a miles-wide German defense line of small machine gun bunkers called "pillboxes," and prepared for Hürtgen Forest, one of the more taxing German fortifications east of the Belgium/German border. "I'd never seen men looking so tired and broken," Ray recalled in the book, referring to the infantrymen coming out of the forest. "We were waiting back at battalion headquarters when they passed us — a long line of faces that were as worn as the uniforms that hung from their bodies. I knew why the sight struck fear into me: we were their replacements. Where they had just come from, we were going." 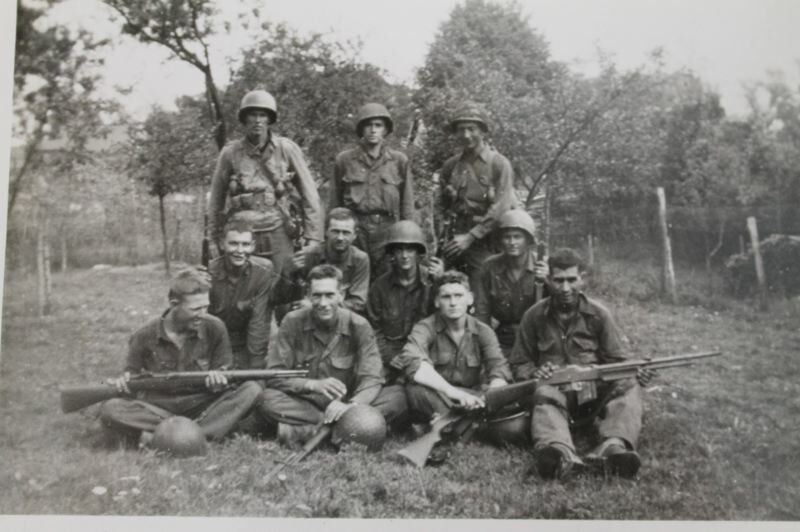 On Nov. 6, 1944, Ray's unit was engaged in the Battle of Hürtgen Forest. Progress was "painfully slow — sometimes we'd fight all day and advance only by three or four trees." German artillery rained down from the towering trees, sending chunks of timber and shrapnel to the forest floor. Ray was checking on his men one night near the first of December when he was caught between foxholes as his company was shelled by the Germans. Shrapnel tore a "wide jagged cut" on Ray's thigh. The head of his platoon poured sulfur powder on the wound and tied a bandage around Ray's leg. Using his rifle as a crutch, Ray slowly made his way out of the forest to the aid station. After a circuitous route through Brussels and Paris, Ray finally found himself in an American tent hospital in Cherbourg, under the care of Lt. Betty Carter. Betty Carter was a Portland native and graduate of Good Samaritan's Nursing Program. Desperate to do her part for the war effort, she tried to enlist in the U.S. Navy, but was denied because she had an overbite and the Navy believed that made a sailor prone to seasickness. The U.S. Army didn't subscribe to the overbite/seasickness theory, however. They readily accepted Betty in November 1943 and sent her to Fort George Wright in Spokane for basic training. 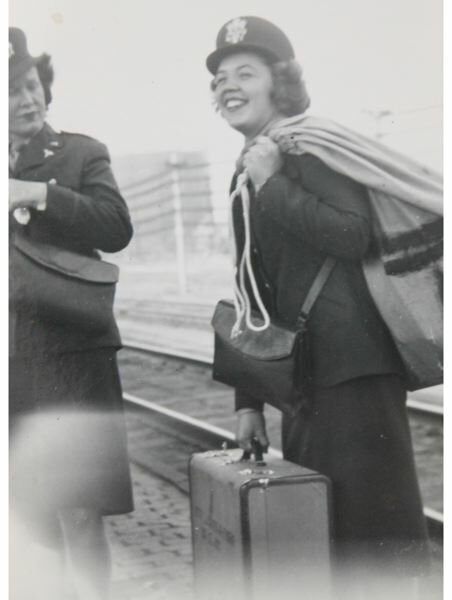 In late August 1944, Betty embarked on an 11-day voyage to Liverpool, England. The crossing was "rough," she said, but she was also one of only two who didn't get seasick during the journey. "Life below deck was different from what I'd imagined, too," Betty wrote in a letter to her parents in September 1944. "The enlisted men were crammed in like sardines, while the officers — including us nurses — were only four to a cabin and had our own lounge. We even got better food than the others. It bothered me, so some of the other girls and I would fill our helmets with the afternoon pastries and take them down to the GIs." By September, Betty had been assigned to the 167th General Hospital in Cherbourg, France. "The hospital here is vast," she wrote in another letter to her parents. "There are 1,500 beds and a huge staff of doctors, nurses, orderlies and probably some other people I've never even seen yet. I'm on Ward B, where the men come after they've had surgery." Tired and in pain from his injury, Ray awoke in a bed at the 167th, to a dark, curly-haired nurse, who introduced herself as Lt. Carter. After exchanging a few pleasantries, including discovery of a common strong faith in God, Betty explained that Ray would be stitched up and spend the next 30 days recovering from his wounds at the 167th. "I was done in," Ray wrote in the book. "She was beautiful. There was a lightness about her — a sense of air and freedom and hope. Her eyes glowed with more life than seemed possible in a single human being. And she had a mouth that I didn't believe could be capable of forming anything but a smile." Though the pair chatted daily while Betty changed Ray's bandages, there was still an unspoken barrier — she was an officer; he was enlisted. "We were together every day for a month," Ray said. "We went to church, the movies. I didn't want to get her in trouble but we still got to know each other very well." By the time January 1945 rolled around, Ray was ambulatory — albeit on crutches — and able to be transferred to England for further recovery. He was not ready to say goodbye to Betty, however. The morning of Ray's departure from the 167th, he waited outside the tent for Betty as her shift ended. "I knew that we had no time to waste and that if we were caught, she'd be the one who would suffer the consequences," Ray recalled in the book. "So I skipped straight to the point. 'Betty,' I said, using her Christian name for the first time, 'if we get out of this, will you marry me?'" A common practice among infantrymen during World War II was to take "souvenirs" from among the dead or dying enemy soldiers. Although Ray found the act somewhat repulsive, in his small collection of personal effects was a gold ring he had acquired from a dying German soldier. After Betty accepted Ray's proposal of marriage, Ray pulled the ring out of his pocket and held it out to his future bride. "I decided to wait to tell her how I got the ring," he said. Ray was sent to a hospital just outside Oxford, England, in January 1945, to regain his strength and rehab his leg. He knew the odds of openly disclosing his relationship with Betty — an officer — would be better if he applied for officer training. He passed the entry exam and was told the next training class would begin in April. When Ray rejoined his squad with the 22nd Infantry in France, he learned he had been promoted to Tech Sergeant. The Americans were pushing hard, east into Germany, and by the end of February, Allied troops had crossed the Rhine River further into enemy territory. Ray's commanding officer wasn't the type to settle for sleeping outside on the ground at night. If there was a farmhouse or building nearby, the lieutenant was more than content to commandeer indoor creature comforts. In an effort to get to the next town, where acceptable sleeping accommodations might be found, the lieutenant made an unusual decision to continue the day's forward movement as darkness descended. Frustrated by the decision and bone weary, Ray led his squad across uneven countryside. Suddenly, he found himself isolated and alone in a ravine. Thinking his men were inside the one house he came across, he knocked on the door and discovered an elderly Polish man and his daughter. Ray negotiated with the man for a place to rest and was directed to the barn. "I couldn't find a lock or bar to keep (the doors) closed," Ray said in his memoir. "By that point I was utterly spent. I'd had enough of mud and weapons, of fighting and fear for one day. I was beyond caring what dangers would be prowling nearby while I rested. I just needed it all to stop." Ray dropped his pack, found a patch of straw and stretched out. With Betty on his mind, sleep came easily. Amid tormented dreams riddled with the realities of war, Ray heard clapping. As it grew louder and more frequent, Ray realized it wasn't clapping — it was bullets. Quickly, Ray understood that the Germans were shooting through the barn walls, each round getting closer to where he lay. Then came a moment of quiet. "A German voice called out orders I didn't understand," Ray wrote in the book. "If I stayed in the straw, the gunshots would reach me within seconds. There was nothing else I could do but full my lungs with air, lift my head and shout, 'Comrade! I surrender!'" 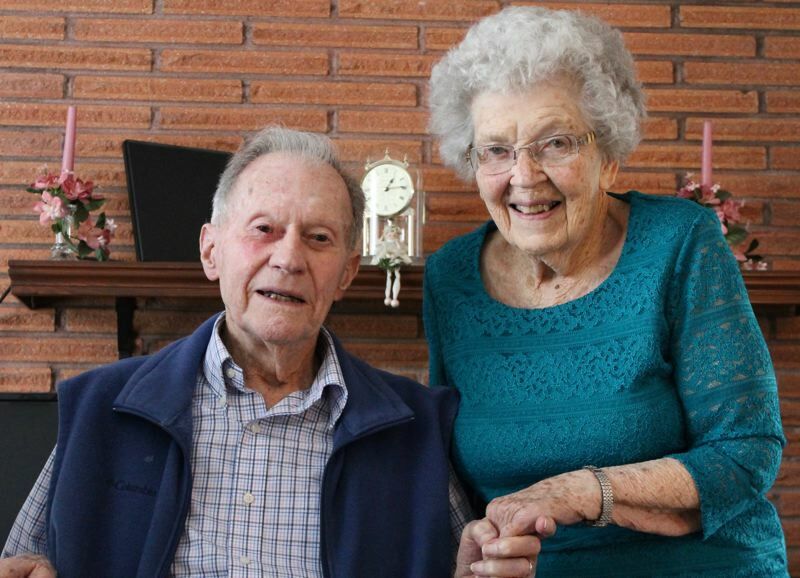 Since Ray's discharge from the 167th hospital in January, Betty had been faithfully writing him letters. She talked about her work and her family. But the winter in Cherbourg was one of the worst on record up to that point, with unending snowfall and bitter cold temperatures. 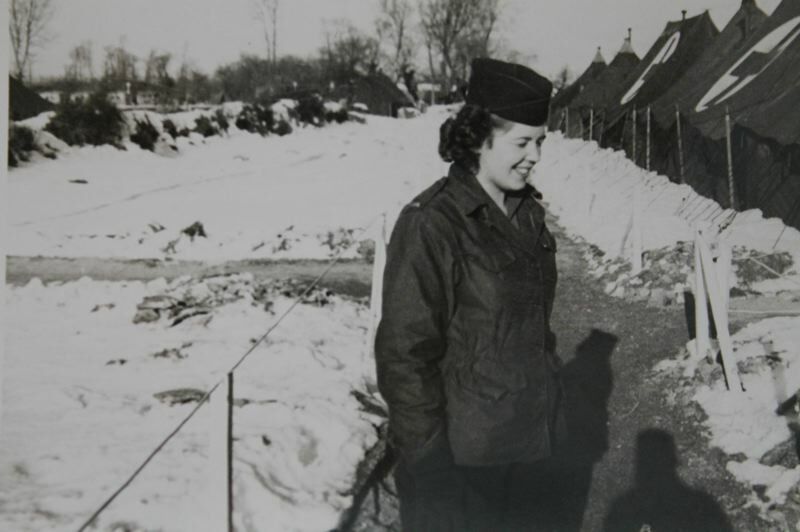 Most of the wounded were coming in with "trench foot," Betty recalled, aka "frozen feet." Still, her letters to Ray were upbeat and looking forward to their future. "The other day someone asked me where you and I are going to live when we get married," Betty wrote in March 1945. "I realized I don't know. Wherever you want to live will be just fine with me. Just as long as we have six daughters!" After being captured and interrogated by an officer, Ray was told he would be moving out with the German infantry and taken to a "prisoner of war camp or to prison." For two days, the group walked through the German countryside. They spent one night in a "dark building, hundreds of years old . . . It looked like a cross between a church and a fairy-tale castle," Ray wrote in the book. The next morning, Ray and other prisoners were loaded onto a cart and taken to Munich. There, they were met by guards who were obviously SS and transported to what could only be described as a prison. Ray had arrived at Stalag VII-A, the largest POW camp in southern Bavaria. "Dearest Ray," Betty wrote in April 1945. "The most horrible thing happened today at mail call. Major Leonard came to my tent and called my name . . . She handed me two letters and walked out. They were the last letters I wrote to you. Across the address of each was a stamp. One read 'Killed in Action, Return to Sender;' the other "Missing in Action, Return to Sender.' Oh Ray I don't even know what to think." Ray joined a long line of prisoners entering the gates of Stalag VII-A. For the first time since he arrived in France in 1944, Ray questioned if his will and fortitude would get him out alive. "The men I passed looked tired, thin and weak — worst of all, defeated," Ray recalled in his memoir. "Many of them were clearly ill and with their sunken cheeks and hollow eyes, they seemed to be shadows of the soldier they'd once been." Life in Stalag VII-A was a daily ritual of boarding a truck in the morning bound for areas in need of bomb-debris removal. Food was little more than flavored water cooked in a metal barrel. Red Cross boxes sent to the GIs were raided by the Germans before being distributed to American prisoners. Guards took the cheese, meat and coffee from the boxes, usually leaving behind only a chocolate bar and two cigarettes. But by the last week in April 1945, Ray noticed the number of guards was dwindling. On the evening of April 29, word quickly spread that the German guards had fled. The next day, the Americans arrived to liberate the camp. "Some men cheered; others rushed to be the first to see our liberators as they came into view on their tanks," Ray wrote in the book. "I just sat outside the hut and listened as the sound of freedom grew louder and louder in my ears." 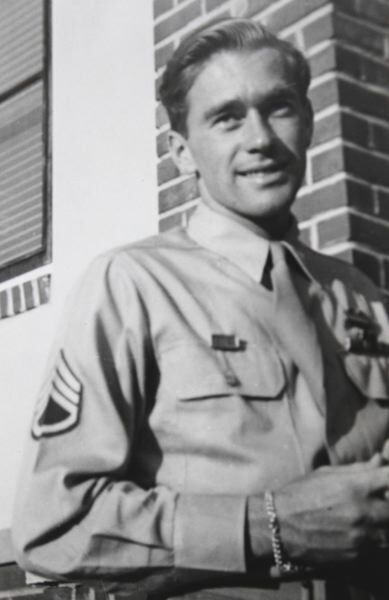 Two days after the camp's liberation, Ray joined other POWs on a flight to La Havre, France. Eight days later, they were on a ship bound for Camp Kilmer, New Jersey. "As we came level with the Statue of Liberty, the crying started," Ray said in his book. "Inside each of us, stoppered up like poison, were months and years of war, pain and fear. We'd buried it in order to fight and survive, but as we drifted by Liberty Island, our cheeks wet and our breathing stalled, just a little of that pain and fear was released." On a late May afternoon, Ray dropped his duffel bag on the front porch of his parents' home in Columbus. Once the "crying and laughing" subsided, Ray's mother handed him a letter they had received from "Lieutenant Betty Carter," inquiring about Ray's whereabouts and condition. He rushed upstairs to his old desk to pen a reply. "To my darling Betty," the letter dated May 27, 1945, began. "I arrived home today. There was so much joy and so many tears, but nothing compared to how I felt when I was handed the letter you sent to my parents, asking if they had any news about me ... Betty, I'm so thankful you wrote to ask about me. May I ask one thing of you in return? I'm a little beaten up and I don't look too good right now, even though every day I'm regaining strength. Will you still marry me?" Lt. Betty Carter was standing dockside in Marseilles, France, waiting to board a ship headed to the United States three months later. An hour before sailing, the group received its last mail call in France. "This time the officer called my name," Betty wrote in August 1945. "I walked over and reached out my hand for the letter he was holding. As soon as I saw your writing on the front, I knew you were alive. I let out the loudest, longest scream you've heard in your entire life! The whole dock must have heard me." A few weeks later, Betty was visiting family in the Midwest, when Ray invited her to Columbus to meet his family. He secured her a hotel room and for the first time in nearly eight months, the pair reunited. "She opened the door, we fell into each other's arms and kissed for the first time," Ray said. "That's a long time to wait to kiss your fiancé." Ray and Betty were married in New Orleans on Sept. 29, 1945. They settled in Columbus, where Ray went to work as a financial clerk for the Veterans Administration and Betty briefly returned to nursing. They raised seven children, including three sons who were in the armed forces, and eventually became grandparents to 19 and great-grandparents to 13. In 1948, the family moved to East Multnomah County. Ray became a property management officer for the Bonneville Power Administration, a position he retired from in 1983. Ray still experiences nightmares from his time in the European Theater, a lingering effect that can now be attributed to Post Traumatic Stress Syndrome. Though his childhood dream of flying jets — along with his desire to become an officer in the Army — never came to fruition, Ray ensures Betty knows her commitment and love for him enabled him to survive hell on earth. "I salute her every day," he said, laughing.